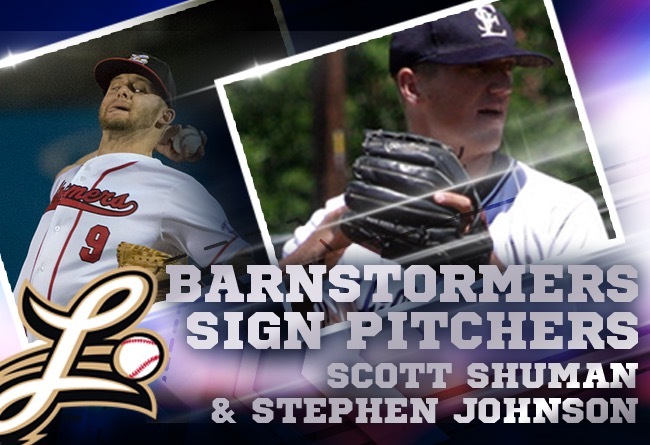 (Lancaster, Pa., Jan. 29, 2018) - The Lancaster Barnstormers have signed two right-handed pitchers to 2018 contracts, it was announced today by manager Ross Peeples. Right-handed reliever Scott Shuman, who represented Lancaster in the 2017 Atlantic League All-Star Game will be back for his second year in Lancaster. In addition, Stephen Johnson, a one-time San Francisco Giants farmhand, will join the ‘Stormers for the first time in 2018. They are the sixth and seventh players to sign with the Barnstormers for 2018, the second for Peeples at the helm. Shuman is the fourth member of the 2017 squad to return. Shuman, who will turn 30 before Opening Day, led the Barnstormers, and was fourth in the Atlantic League, with 62 appearances in 2017. He went 3-1 with two saves and a 2.91 ERA over 58.2 innings of work, giving up only 47 hits and four home runs over the season. The Valdosta, GA native struck out 73 for the year, an average of 11.2 whiffs per nine innings. During one stretch, Shuman struck out at least one batter in 22 consecutive short relief appearances. He threw a perfect inning for the Freedom Division in the All-Star Game, one of only four pitchers of the 18 used in the contest to do so. Shuman struck out one. Lancaster is Shuman’s third stop in the Atlantic League, having pitching previously with Bridgeport and Long Island. Earlier in his career, the Georgia Southern product pitched in the San Francisco and Tampa Bay farm systems, peaking at the Class AA level. Johnson, who will be 27 when the season begins, was drafted by the Giants in the sixth round of the 2012 draft and reached Class AA Richmond in 2015. He was dealt to the Cincinnati Reds in August of 2015. In exchange, the Giants received Major League veteran, and former Philadelphia Phillie, Marlon Byrd. Overall, in the 2015 season, Johnson was 3-0 with a 2.97 ERA in 50 games and struck out 79 batters in 66.2 IP. The native of Washington, DC, who grew up in Colorado, went 1-4 with a 4.82 ERA for the Class AAA Louisville Bats (Reds) in 2016. He returned to the Giants system last year but missed most of the season.